We’re in our house! A more detailed post with photos and etc. will follow, but first I wanted to share this morning’s commute to school and the sheer cuteness that ensued. We live about 2.5 km from the kids’ school, up hill both ways. Since Tuesday afternoon the kids and I have spent each commute figuring the optimal bus/walk combination that minimizes sheer flights of stairs. The school sits at the top of a bluff, called–perhaps a bit unoriginally–The Bluff by local expats. Today’s morning route included a 15-minute walk to the not-quite-nearest train station, followed by a bus ride that climbed The Bluff and dropped us off right at the school. Easy. Just checking my phone! Not all taking pictures of random kids on public transportation! On the bus ride back to the station, I was one of three adults. 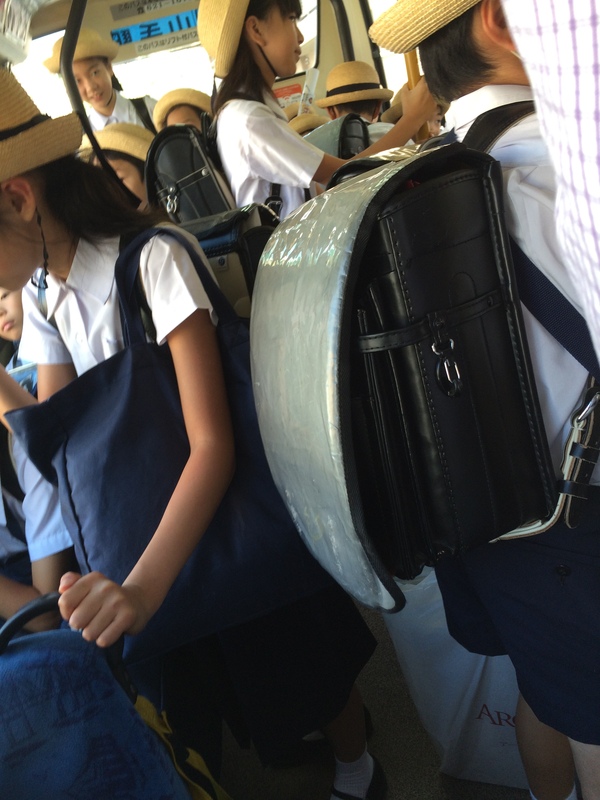 The rest of the bus was packed with school kids in a typical elementary school uniform: white blouses, navy shorts/skirts with suspenders, black randoseru (square leather school backpacks), and straw boaters. With chin straps. Let me say that again: Straw boaters with chin straps. 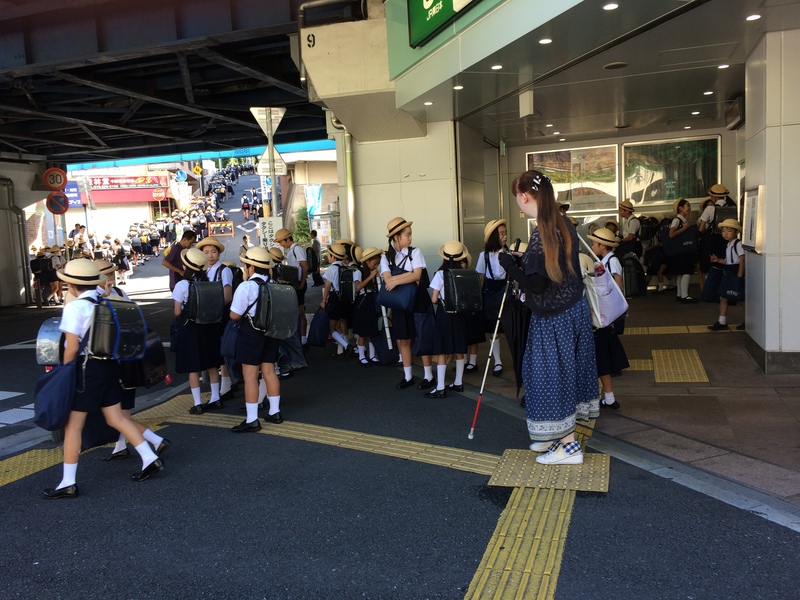 While most of the kids were young, some of the older ones looked about twelve, which probably meant that they were thirteen or fourteen since Japanese kids are shorter than their American counterparts. Think about the nearest thirteen or fourteen year old boy in your life. 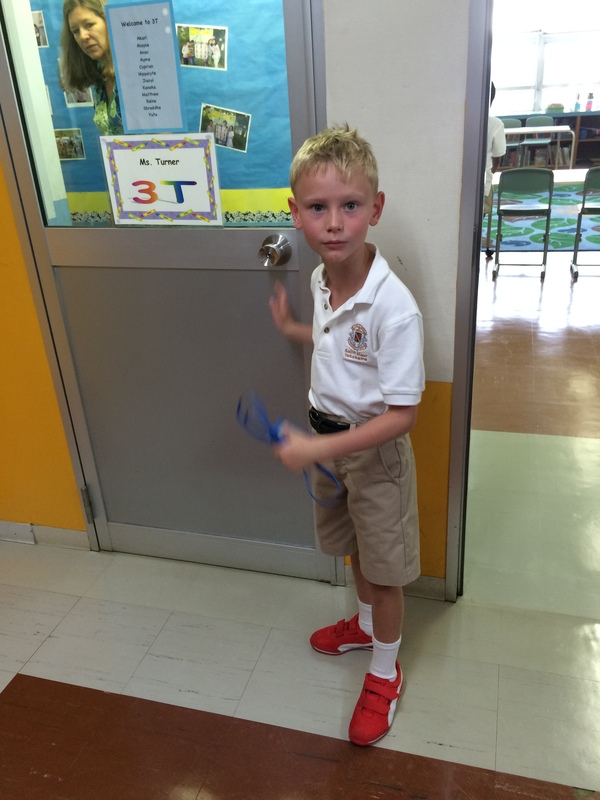 Now imagine telling him to dress for school in navy shorts with suspenders and a straw boater. With a chin strap. The kids were unaccompanied on the bus, as all school kids are here. 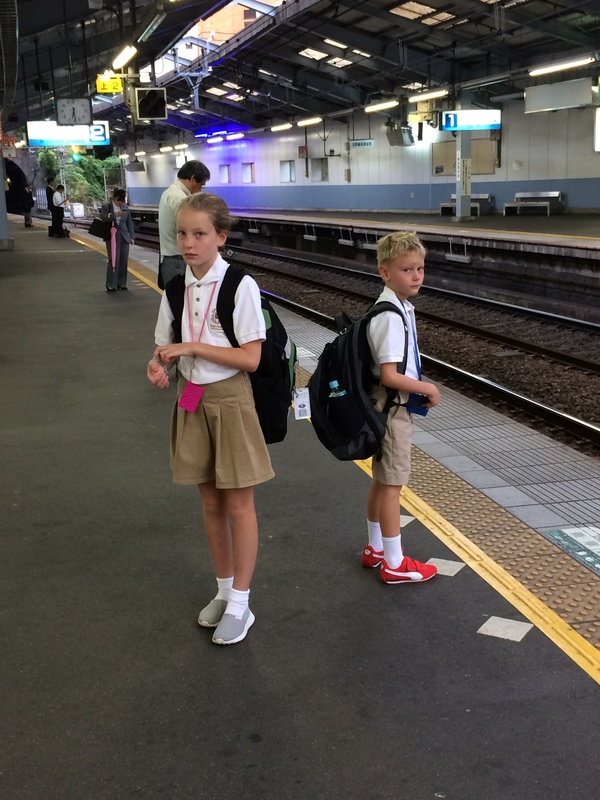 They got off at the station and joined dozens of their classmates in the trek to school. Note the stream of kids uphill in upper left corner. The blind woman center right was not their chaperone–they had none. First day of school! 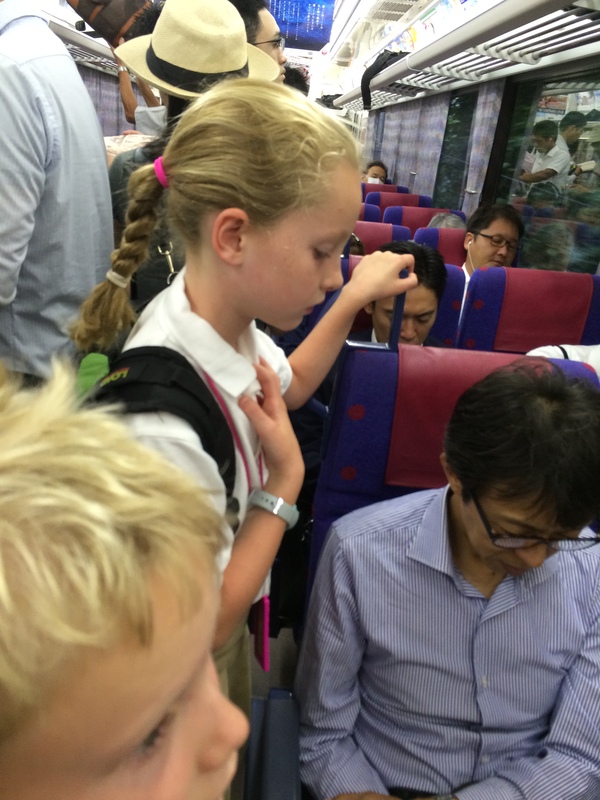 The school supplies, the new uniforms, the 75-minute each way commute…. Crowded trains? What crowded trains? The platform looks fine to me. 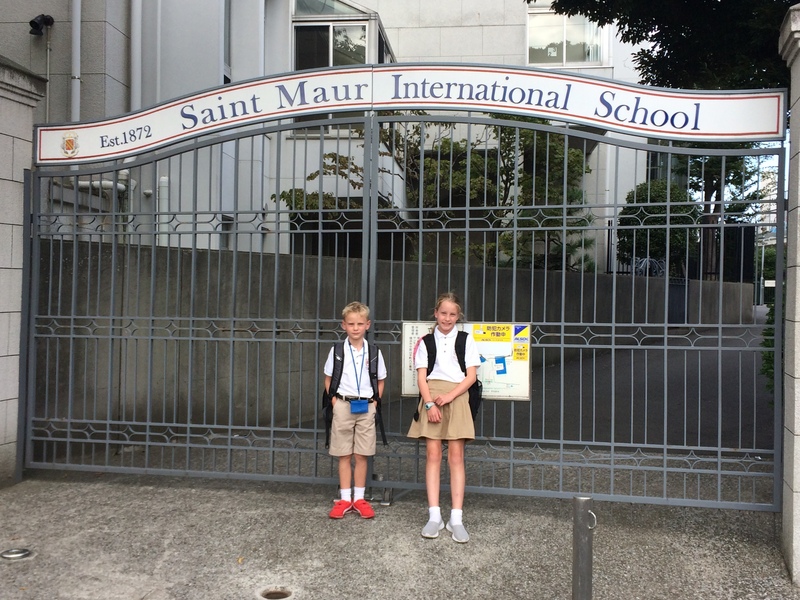 The kids’ are attending St. Maur International School, an international Catholic school in Yokohama. Yokohama is the next city over from Yokosuka, where Mark works. We decided to live closer to the kids’ school than Mark’s work, and the plan was to have our house before school started. So much for that plan. 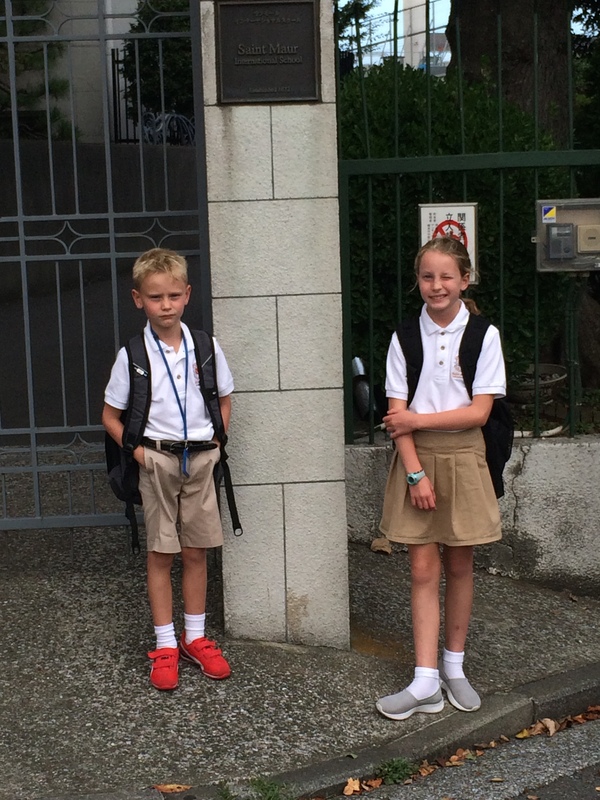 Instead, the kids started school today while we are still in temporary lodging on base. That meant a 75 minute commute each way on crowded trains. 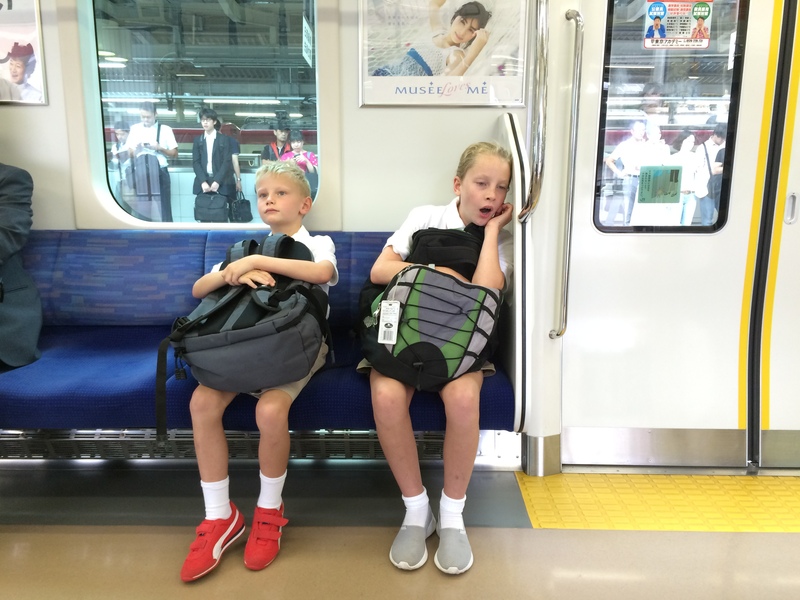 Welcome to Japan, kids! Tessa unsuccessfully tries to will the man in front of her to stand. We rode 40 minutes like this. It started out fine on the deceptively-empty platform at Yokosuka-chuo station. I copied the train schedule ahead of time and we made it on the 6:35AM train as planned. Mark assured us that we would have seats since the train was so early. Mark was wrong. So after 40 minutes of the classic Japanese train sandwich, we got off at Yokohama station and found our transfer point for the next train. I checked and double checked that the train was going in the right direction. Onward! The train traveled one stop, and everyone got off the train on one side while crowds waited at the doors on the other side. I immediately recalled the words of our Inter-Cultural Relations instructor during orientation: If everyone gets off the train, then you get off the train, too. Then she said it again. I stayed on the train. The other doors opened and everyone rushed onboard and started running–and I mean running–for seats. Tessa loudly declared, “It’s like musical chairs!”. I scowled at her, but she was right. I’ve never adults move like that for seats. Then I looked up at the Next Station sign and saw that the train was heading back to Yokohama, the station we just came from. That’s right. The train went one station, discharged everyone, picked up a new load of passengers, and returned. I yelled at the kids and got us off the train. So we wandered the platforms and found the next train that continued in our desired direction. The rest of the trip (bus ride) was uneventful. I delivered the kids to their classrooms and snapped a few photos. Tessa was happy to oblige; Cy, not so much. Then I left and reversed the journey back to Yokosuka to meet Mark and the realtor for lease signing. …While Cy is all “I need to go and unpack my bag!”. Afternoon pick-up was slightly less exciting. Instead of taking the train from Yokosuka again, Mark and I drove to the new house in Yokohama for a walk-through with the realtor and owner. From the house I figured out the bus-walk route to school to pick up the kids. 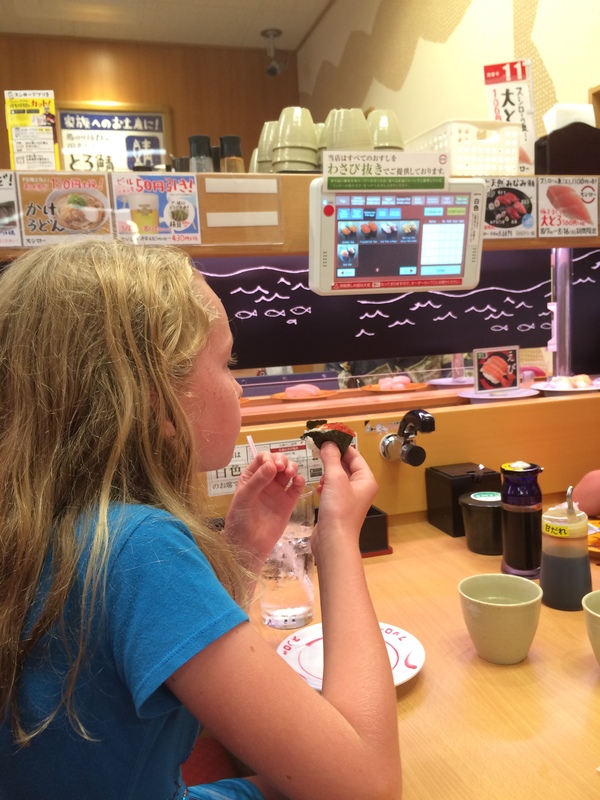 We returned to the house, unloaded what we had in the car, then headed back to Yokosuka for homework and a celebratory round of sushi from the sushi-go-round. And no, we didn’t steal anyone’s food this time. 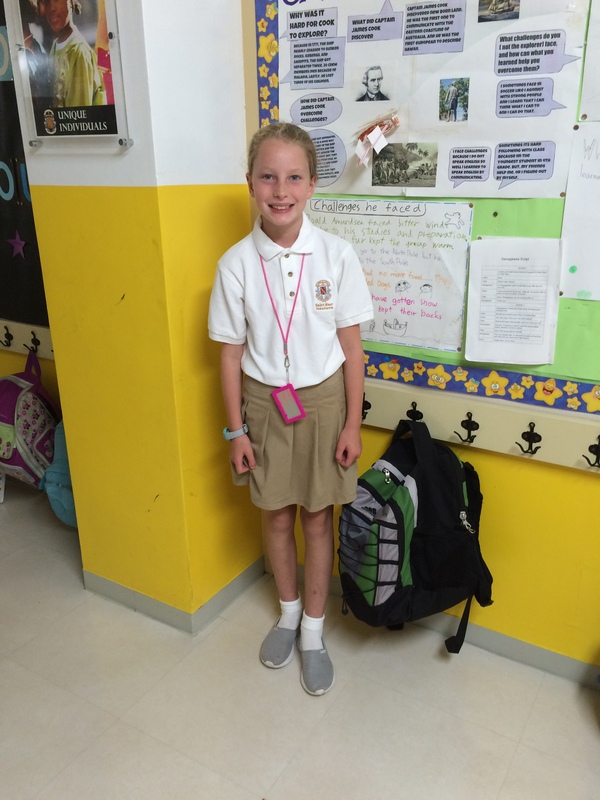 St. Maur International School’s newest students at the end of their first successful day. Driving! We’re Americans, so of course we have a car! Mark arrived in Japan a few weeks before us, giving him the chance to get his license and buy a car prior to our arrival. Since importing U.S. cars is prohibitively expensive, Mark took part in the sacred ritual of overseas service: the lemon lot. He asked me for guidance before he took the leap. I gave him the following: Big enough for the four of us, Ruby, and some stuff. Preferably something that you can only find in Japan. Bonus points for a crazy color. Even before he bought a car I had a name for it. I don’t normally name my cars, but the occasion seemed to demand it. So I started with the Japanese translation for lemon, which is…..remon. Really. You can check it here, and here. So Remy the Remon was the first draft name. It didn’t stick, though. I didn’t relish the thought of explaining over and over, “It’s really the way to say lemon in Japanese! I’m not being culturally insensitive!!”. 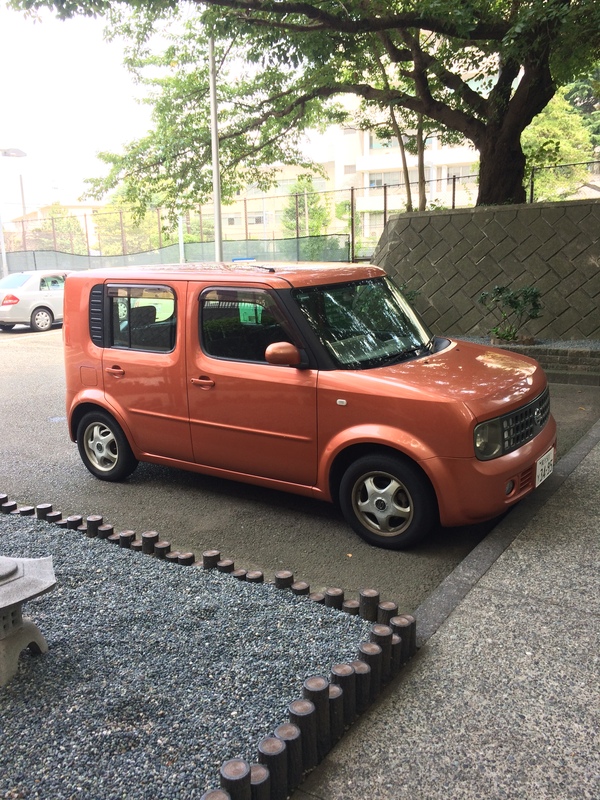 Mark ended up buying the beauty that you see: a 2004 Nissan Cube. Technically it’s not an only-in-Japan car, since it was available in the U.S. for a few years. But it tanked in the U.S., and it’s no longer available–so close enough. Once I saw the orange color I immediately ditched Remy the Remon but decided to stick with the citrus theme. So I present….Benji the Orenji! Before we committed to the name I asked our Japanese realtor if benji means anything inappropriate in Japanese. Kato-san replied, “No, it’s a dog’s name.” “For us too!!!”. She was far too polite to say anything or even roll her eyes, but I’m sure that she filed this one away in her Those Crazy Americans file. I have seen several other orange Cubes on base, and I always give an enthusiastic Benji wave. So far no one’s actually waved back. Yet. Coming up: driving on the left, remembering to turn on the turn signal instead of the wipers before turning, and other adventures. When is Sushi Go Round like IHOP? Here’s a shot. Looks a lot like IHOP, doesn’t it? It’s just as bustling, too. 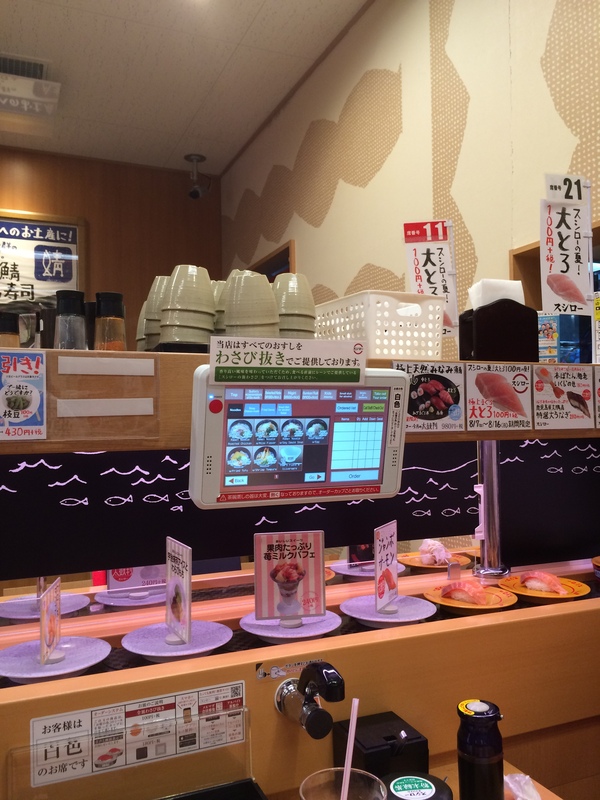 We showed up at the 100-Yen-Per-Plate-Sushi-Restaurant-That-Probably-Has-A-Name-But-I-Can’t-Read-It-Because-It’s-In-Japanese and faced the first challenge–checking in. A monitor greets the customers, where you indicate how many in your party and whether you want a booth or counter. We got our ticket (094), whipped out our phones to figure out how to say 94 in Japanese, then settled in for the 15 minute wait. The hostess called out numbers in Japanese, as one does in Japan. I tried to listen for numbers without much luck when Tessa came up with a great idea: if no one else in the waiting area gets up then it’s probably our turn. 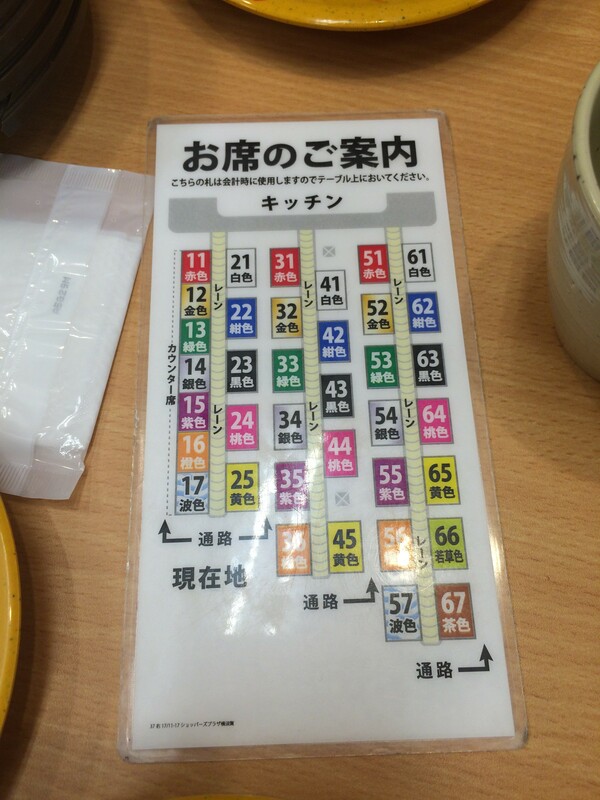 The restaurant’s layout. We were seated at table 21, in the upper left corner of the card. Smart girl, that Tessa! Mark had an even better idea: standing near the monitor that showed which number was up. As our waitress led us to our table she handed us this card and pointed out that we are table 21. She followed this with instructions in Japanese that were probably extremely helpful and likely would have prevented what happened next. 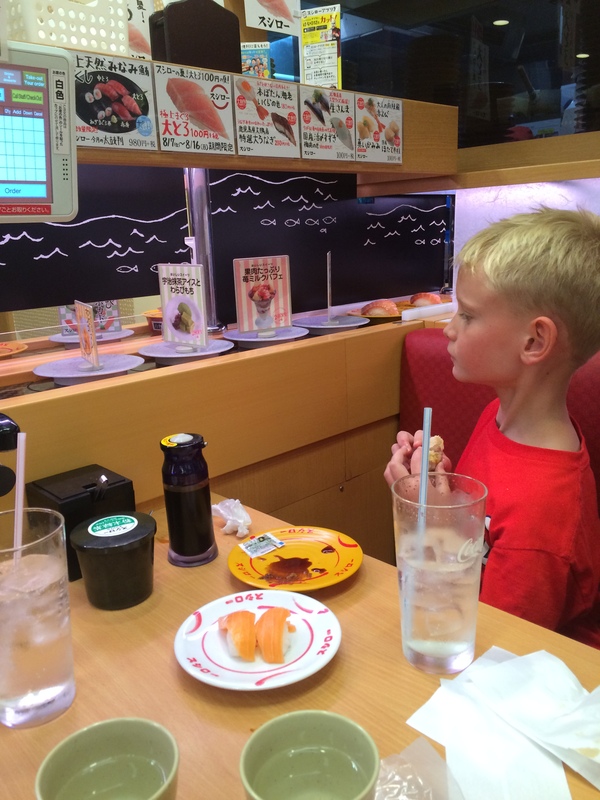 The kids love sushi. Love it! 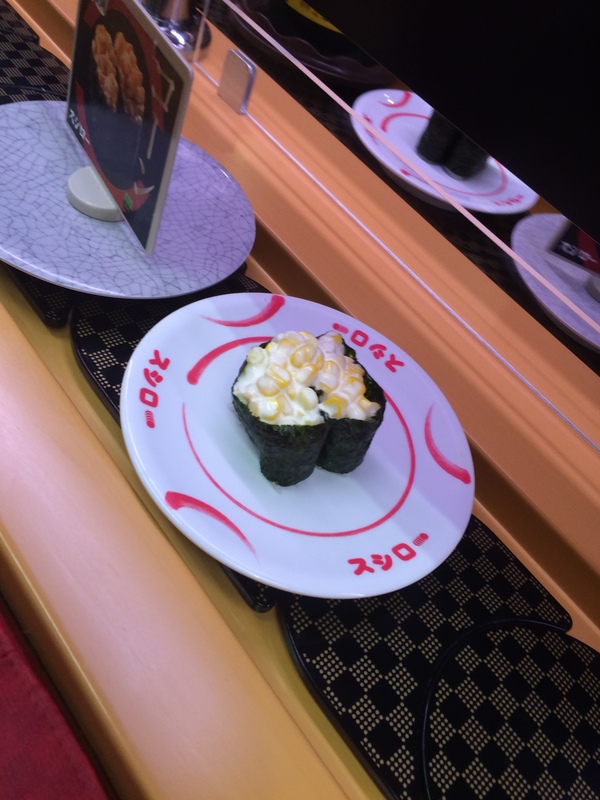 We were familiar with sushi go rounds from home, where the plates of sushi travel on a conveyor and you grab whatever looks good. So we saw sushi going around, and we took what we wanted. Like this. Note the color-coded stickers on the red under-plates. White is ours. Yellow is not (oops). 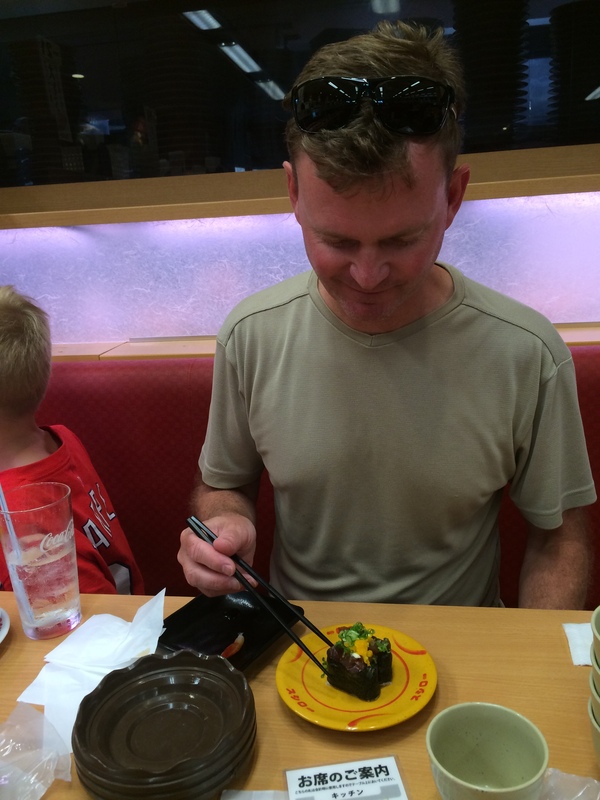 After grabbing several plates of sushi wily-nilly we had this odd feeling that maybe…we…were…taking…someone….else’s…. And we were. Remember that card above, with tables color-coded? Our table was 21, or white. 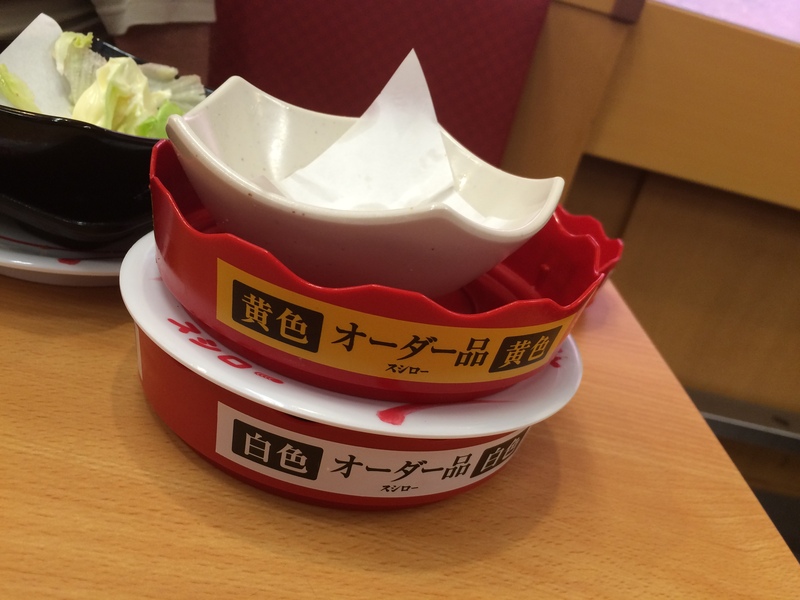 That meant that our special orders would come on a red under-plate. Each station along our conveyor had a unique color. 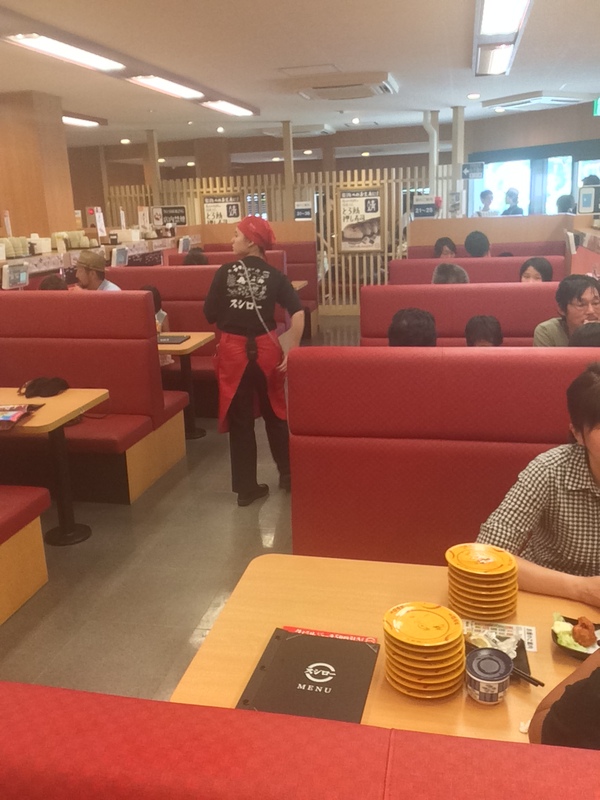 Unfortunately for everyone else on our conveyor belt, we were seated at the first booth coming out of the kitchen. That meant that we had first crack at stealing everyone else’s food. Yessssss! Thankfully we still paid for the food we ate since the totals are tallied by the used plates in front of you. So the other tables re-ordered and I saw the waitress hand-delivering their re-orders. Sorry, neighbors! Egg salad (with mayo!) gunken. In the States there is a lot of hand-wringing over “non-authentic” sushi–the horror of the California roll, or dragon rolls, or anything with cream cheese. Japan has no problem with this, as proven by the following selections: corn with mayo and egg salad. 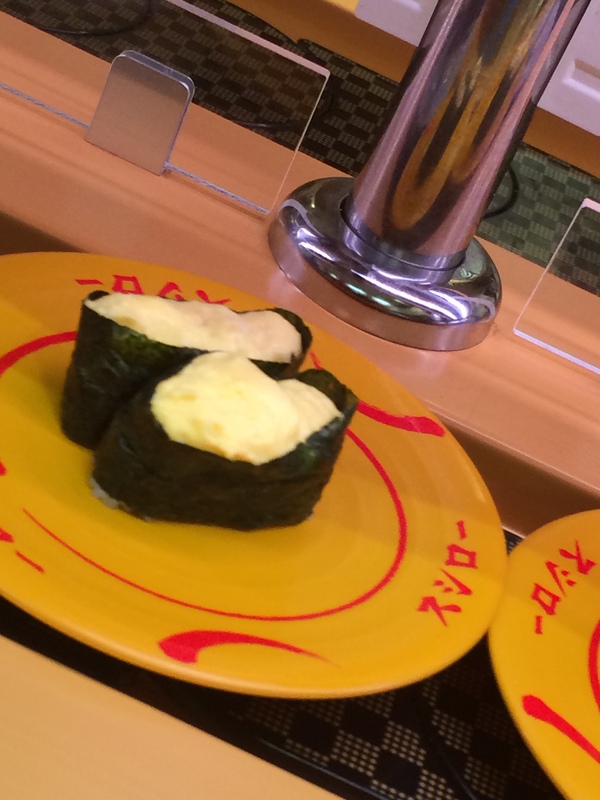 The Japanese love their mayo and put it on sushi, pizza, you name it. Back to the special orders. Each booth has its own screen for ordering. Just about every electronic screen in Japan (train tickets, ATMs, etc.) has an English button in the upper right corner. This one did too! Relief. So we started ordering away. About a minute before your plate arrives the screen plays a song and flashes a message about your food arriving soon. If you miss it (or your ignorant/American neighbors steal it) there’s an I-didn’t-get-my-food button. After about an hour of this we settled up. The waitress came over to tally our plates with a plate ruler–never mind counting plates! The total for the four of us: 4200 yen, or around $35. See you next time, 100 yen per plate sushi restaurant!! We’re here! The fourteen hour flight was long but eventful. The only problem was checking in our dog, Ruby. Both Mark and I called United weeks ago to confirm her reservation, and both of us were assured that she was on the flight. However, at check-in said reservation vanished. After two hours of waiting the gate agent finally sorted out her booking and sent us all on our way. We arrived at the airport three hours ahead of departure, expecting plenty of time for eating lunch and buying trashy magazines. Instead we hustled for the gate and managed to buy lunch to eat on the plane and scramble aboard. But I still found time to buy the latest US Weekly. Because Priorities. Upon arriving at Narita we were greeted by Mark’s co-worker and sponsor, Felicia. A sponsor is a military tradition; he or she makes necessary reservations and passes along advice on settling in. Felicia arranged for a mini-bus to transport the four of us, our mountain of luggage, Ruby, and Ruby’s over-sized crate (giant ears, that Ruby). We settled in for the two hour drive to the naval base in Yokosuka. Wandering side streets in Yokohama. After dropping Ruby off at the kennel on base, we headed to our home for the next few weeks: the fabulous Navy Gateway Inn! It’s basically a suite-style hotel room with a mini-kitchen, bedroom, and living room. For one or two people it’s plenty of space. For a family of four, not so much. On the flight over I watched an episode of Tiny House Nation, where a family of four in Minnesota built a 207 square foot house as their new permanent home. (Minnesota! Their winter coats and boots alone take up way more than 207 square feet.) On the flight I was incredulous; after 48 hours in this room my attitude is better described as murderous. We have way more than 207 square feet to share, and I am (poorly) drawing on my reserves of patience on an hourly basis. Grabbing a quick ramen lunch in Akihabara, Tokyo. What we have seen and done so far: visited Ruby at the kennel every day; checked out the Akihabara neighborhood of Tokyo, famous for its manga and anime stores; eaten at ramen and conveyor belt/sushi-go-round restaurants; ridden the train, a lot; splashed in the pool at the inn; checked out a potential house to rent for the next few years; and shopped at a 100 yen store. What’s to come: visiting the kids’ school, checking out a water park, and seeing the giant/famous Buddha in Kamakura. So this is it. Here I sit in my home in Washington, DC on August 1. Two days from now–right now–we will be on a plane to Japan to start our new life there. Our last few weeks have been consumed with the details of moving. Getting the house ready for the movers. Taking the dog for the final vet’s exam and getting the paperwork endorsed by the USDA within ten days of departure. Picking the kids up from camp and tackling their mountain of laundry. Squeezing in quick visits or at least quick goodbyes with as many friends and family as possible. 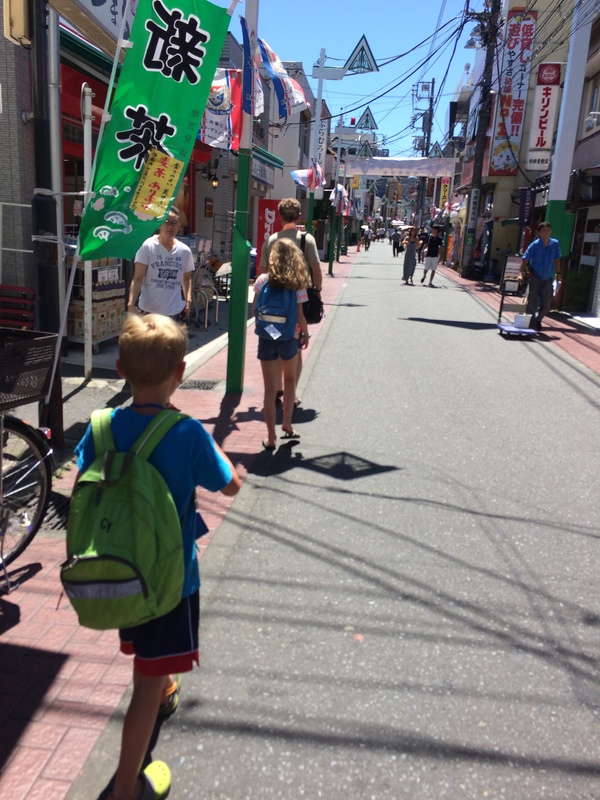 I decided to start blogging about my experiences in Japan primarily to keep family and friends informed of what we are up to. So chances are if you’re here you know me in person already. But who knows–perhaps greater Interwebs stardom awaits! When I asked friends for suggestions for the name of this blog, one friend posed a great question: What’s your blog going to be about, anyway? 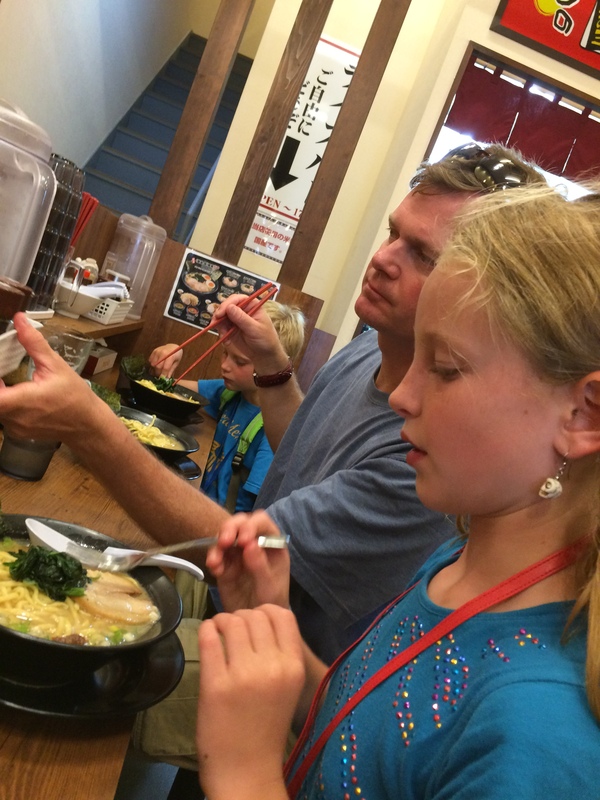 Kids, family cooking, general impressions of Japan? The answer is all of the above. I love my kids, husband, cooking, food, traveling–I just don’t want to be pigeonholed into writing about any one thing. I hope to describe my cultural experiences at baseball games, and sumo tournaments, and various festivals. But I also can’t wait to visit Japanese Ikea. Because meatballs.